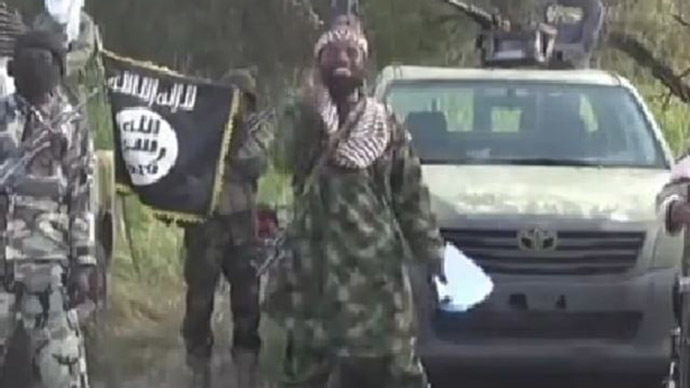 Boko Haram militants have launched an assault on the capital of the Borno state, Maiduguri, on Sunday and engaged in fierce fighting with the country’s military. The offensive started just hours before US Secretary of State John Kerry was due to arrive. A fierce battle raged in the city of Maiduguri, capital of restive Borno State, according to the military and local residents. “Troops are repelling a simultaneous attack on Monguno and Maiduguri by terrorists,” a tweet from Nigeria’s defense headquarters stated. Local residents say the fighting between government forces and the militant group is continuing, AFP reports. #COINUpdate: Curfew is imposed on #MAIDUGURI with immediate effect till further notice as pursuit of retreating terrorists begin. Njimtilo is about 20 kilometers away from Maiduguri. Boko Haram began attacking Maiduguri on Sunday, with locals saying they could hear shelling and that military helicopters were circling the city. Activity in the city has ground to a halt, with shops and businesses closed, while all roads have been shut down, according to Reuters. A curfew has also been imposed. Dozens of people were killed in the attack in the morning, AP reports. The roads leading to the city are blocked. "We believe hundreds of thousands of civilians are now at grave risk," Amnesty International said. In the evening, a fresh battle started between militants and government forces near Maiduguri International Airport. “I can hear sporadic gun shots and bomb explosions, I am sure the boys are back to retaliate for what was done to them this morning,” Bello Muhammad, a local, told Reuters. Kerry is the first US diplomat to visit Nigeria since 2012. However, his schedule sees him traveling to the southern city of Lagos, over 1,500 kilometers away from Maiduguri. The vast area of Maiduguri is seen as a key strategic goal for Boko Haram, who want to carve out an Islamist state in northern Nigeria. The terrorist organization last tried to take the city in December 2013. They managed to seize a local air force base and clashed with local troops. Nigerian President Goodluck Jonathan recently visited Maiduguri as part of his election campaign, with the country set to go to the polls in February. His main rival in his bid to seek re-election, Muhammadu Buhari, is due to arrive in the city on Monday.